Hyponatremia, a condition of very low blood sodium, is a potential hazard of drinking too much water during exercise, say experts. This condition, known as exercise-associated-hyponatremia (EAH), could potentially lead to major neurological problems and could even be fatal. Water is the basic need for cellular health. About 60% of each living human cell is water. Water exists both inside and outside cells, maintaining a fine electrolyte balance. This balance is essential for basic cellular functions, which generate energy and keep us going. At the macro level, water is required for carrying nutrients to various parts of the body, keeping our joints supple and skin looking youthful. 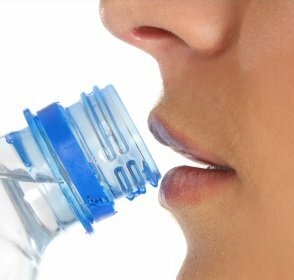 The hazards of dehydration are well documented and well known. However, ‘hyperhydration,’ leading to EAH, when the sodium levels in one’s body fall to dangerously low levels, comes with its own serious consequences. EAH used to be a concern for endurance athletes involved in marathons, triathlons, and other endurance competitions. Recently, EAH has been seen in individuals engaged in other sports as well. EAH needed to be addressed, and guidelines put in place, to protect international athletes from drinking too much water or sports drinks during exercise. Dr. Mitchell Rosner, a kidney specialist at the University of Virginia, School of Medicine, chaired the guideline development group on EAH. The consensus guidelines are published in Clinical Journal of Sports Medicine. If the symptoms are mild, one should limit fluid intake and monitor conditions. If severe confusion is observed, the affected person needs immediate medical attention. The guidelines recommend that people use thirst as a guide. “If you drink when thirsty, you will not become hyponatremic, and you will not suffer from significant dehydration,” says Dr. Rosner. Rosner, M. (2015). Preventing Deaths Due to Exercise-Associated Hyponatremia. Clinical Journal of Sport Medicine, 25(4), 301-302. Rosner, M., & Kirven, J. (2007). Exercise-Associated Hyponatremia. Clinical Journal of the American Society of Nephrology, 2(1), 151-161.